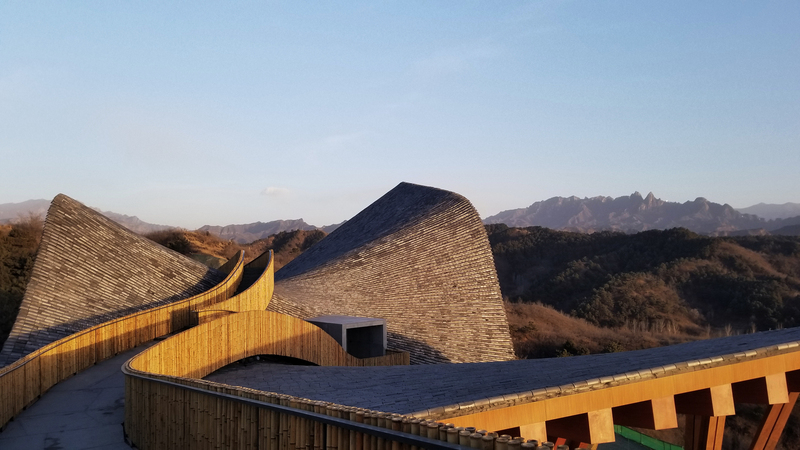 In China, a stunning new gallery winds through the Yanshan Mountains, its undulating form mimicking the spectacular terrain all around it. 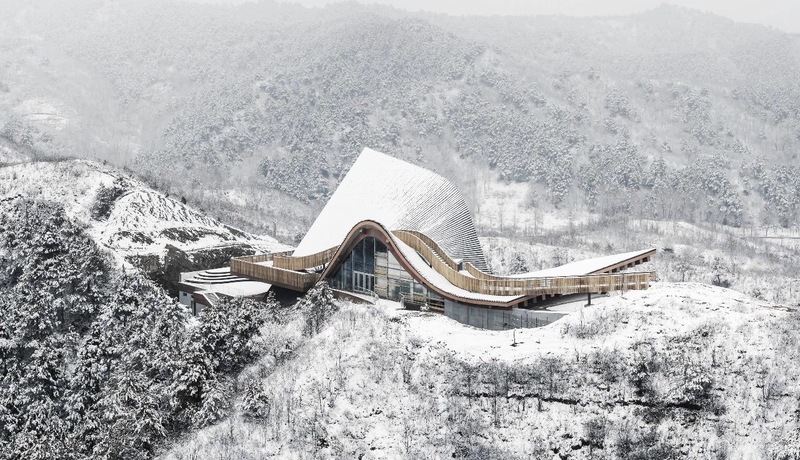 Set on the saddle of a mountain, the Hilltop Gallery — also known as the Phoenix Valley Summit Art Centre — overlooks the Great Wall of China, and its unusual silhouette marries the parametric curvature of modern computer-aided architectural design with organic, locally sourced materials. 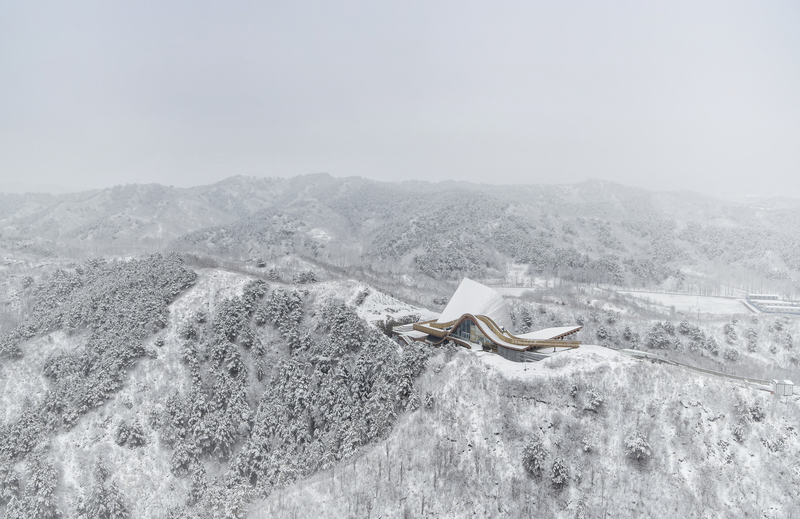 Occupying nearly 28,000 square feet (2,600 meters) of floor space, the Hilltop Gallery was designed by the Chinese firm dEEP Architects to host art exhibitions, cultural projects, and events. 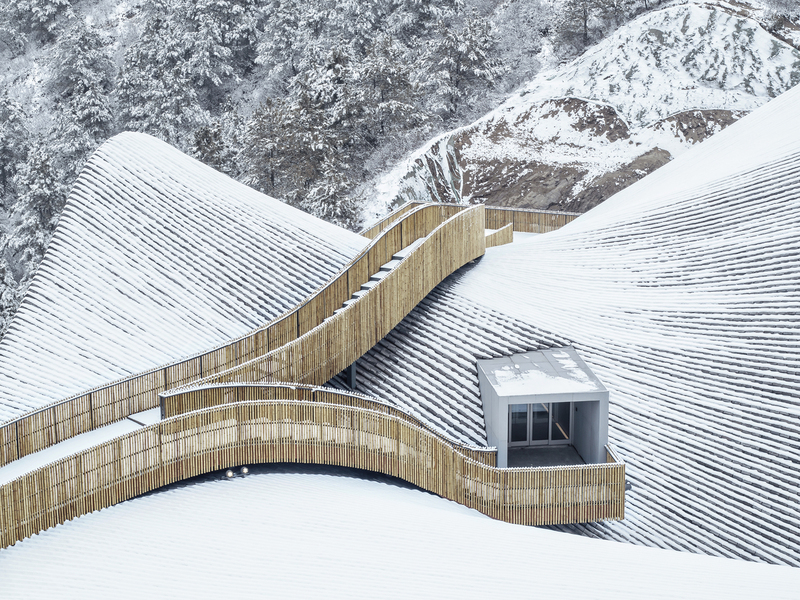 Its billowing roof is entirely covered in bamboo, which was also used to create the railings for a stepped walkway that stretches out over the top of the building, offering an elevated path from the gallery’s upper level to the hillside beyond. 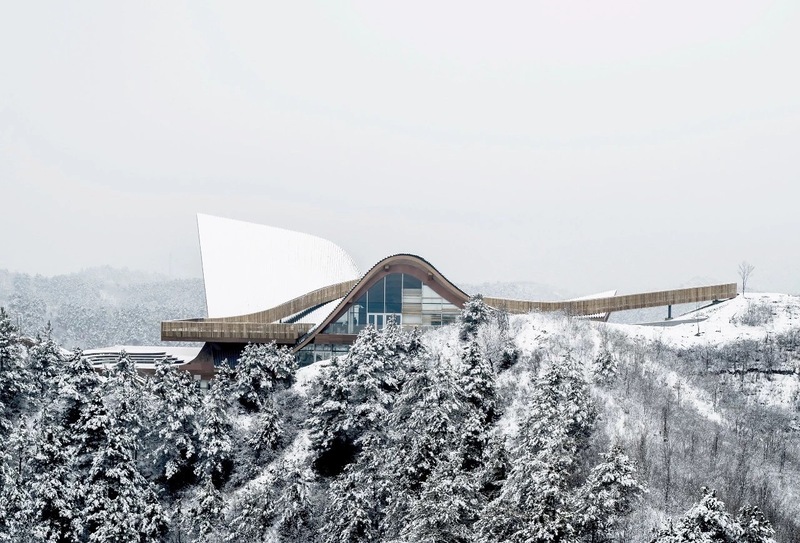 The main exhibition space is located on the ground floor, offering sweeping views of both the dramatic landscapes in the distance and the pine trees just out front. The architects wanted to leave the entire space “constantly submerged in nature,” and the building’s abundant use of glass does just that. This floor is physically tucked into the mountain’s eastern side, with the shadows sheltering an interactive audio-visual room and a theater. 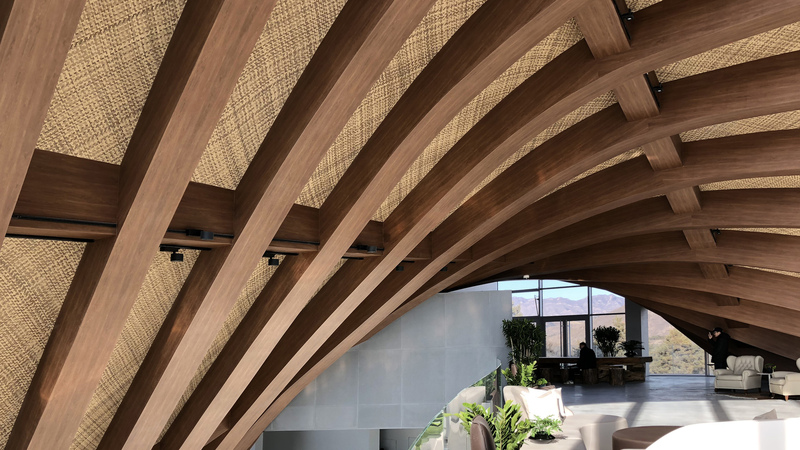 A ribbon-like spiral staircase takes visitors through this space and up into a café, with an outdoor terrace that overlooks the scenery, and finally to the top floor, which itself hosts a dining room and tea rooms and serves as a reception area for VIP visitors. 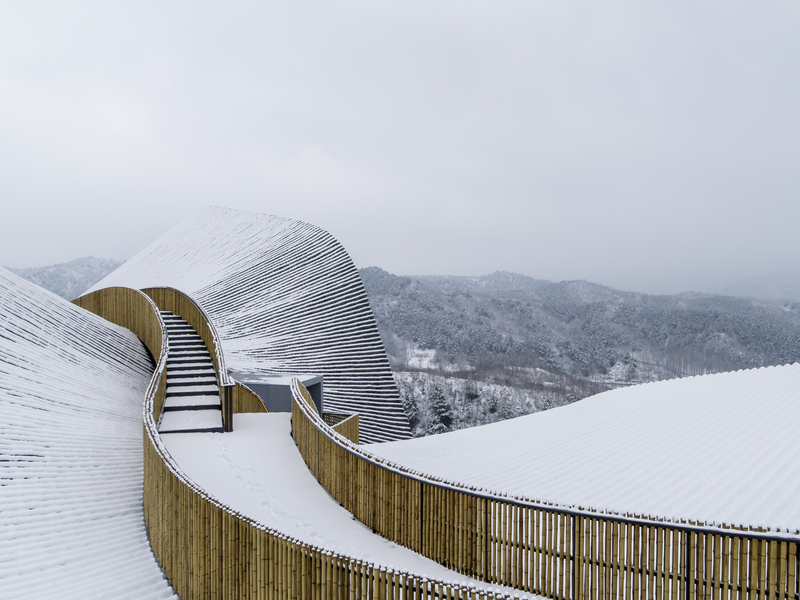 A multifunctional ballroom faces the Great Wall, and a concrete room to the west offers access to the outer walkway. The result is a work of art in its own right: a deeply contemplative space that enables guests to view, interact with, and ponder the art on display while also feeling and appreciating the beauty of the gallery’s physical location. Many art galleries tend to err on the side of total enclosure in the belief that onlookers need a sort of blankness in order to fully appreciate the works. But we don’t exist in a vacuum, and the way the art plays off each setting it’s placed within creates a unique experience that can only enhance its meaning and emotional resonance.